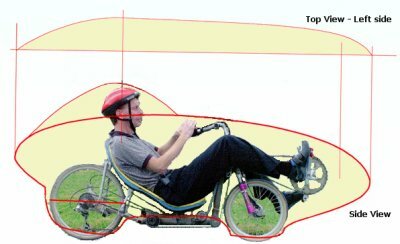 Garrie Hill has been a major force in Human Powered Vehicle development for over 15 years. He created the first aluminum Tour Easy clone frames, and later Gardner Martin began the production of the official model, the Goldrush Replica. Garrie is a currently co-dictator of the only HPV racing organization in North America, the Human Powered RaceAmerica (HPRA). Garrie created and contributed to the .decimach challenge, for the first vehicle to break 75MPH at a .decimach event. 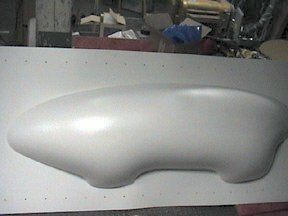 More recently Garrie has been working on creating a group of HPV racing specific parts, including lightweight carbon fiber seats, head rests, and wheel covers. In addition to those parts, he has been working to develop a lightweight, easy to produce HPV fairing. 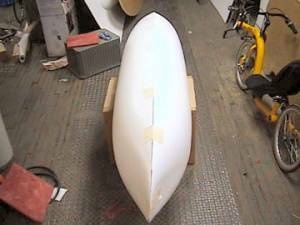 The following pictures are of a semi-freeblown Sintra fairing he is building for Rob Wood. Sintra is a PVC sheet material, solid on the faces and mildly foamed in the core. An extremely durable material, white and a few other colors are available. Garrie is blowing right half/left half shells to limit the necessary depth of draw. Maximum depth is 10.75" in this view. 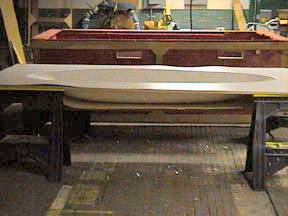 Initial thickness is .118" for the sheet, minimum thickness after blowing is .070". Total cost of materials for the sheet of Sintra + special MDO plywood blowing window + MDO plywood sandwich backer = $90.00 US. Cost for the Sintra for the right half will be $30.00. The same blowing window and backer and restraint bridge get used for both sides of the fairing. This is a front quarter view of the fairing. For scale, the rectangular sheet of Sintra is 48" x 120". In the next blow, the fairing will meet the flange area (which will be trimmed off) at a 90 degree angle. This will allow the left and right halves to be bonded together using H channel extrusion. This shows the rear view of the bubble. Believe it or not, the closure angle is the much sought 11 degree angle. With this shot, it's real difficult to tell. Garrie used a "bridge" to restrict the shape of the bubble. 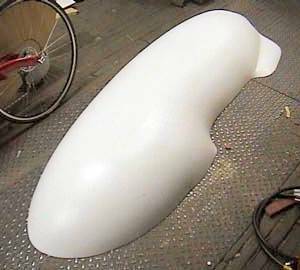 This allows him to control the overall width and shape of the fairing so that it doesn't bulge out in a non-aerodynamic manner. In the next test blow, Garrie will be using "mini-bridges" on the wheel pods to make them narrower. Here is a scale side view of the fairing profile overlaid on Rob Wood's bike. The secondary arc represents the canopy. The half shell plan view is at the top of the picture. Garrie has been hard at work, optimizing his bubble blowing techniques. 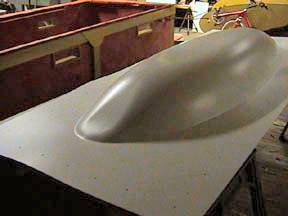 This picture shows a trimmed fairing half shell with a very nice wheel pod shaped by a bridge template. Here's Garrie's son Theron holding the half shell while seated on an M5 low racer. This looks like a really fast shape! 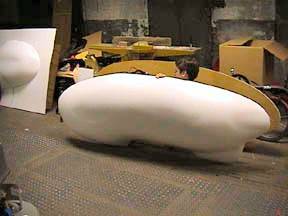 Here's the latest iteration of the bubble shape, with no wheel pods this time. This shows the bubble hot out of the oven, and still in the template. 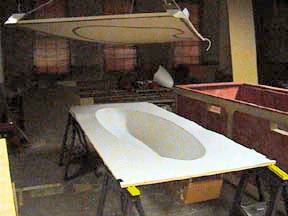 Here's another view, showing the shaping bridge under the template.
. This picture shows the flat sides caused by the shaping bridge. 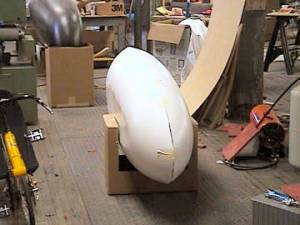 As mentioned previously, the flat sides are needed to keep the fairing width to a minimum. To make the right and left halves mate together properly, and give the human engine proper clearance, the bubble must be blown until the bubble edge is almost 90 degrees to the template. Without the template, this means the bubble would be as wide as it is high (30 inches?). Not too aero! Here's the tail view of the fairing, showing how the bridge template forces this section to be concave, which is contrary to the natural tendency of a bubble fairing. A left and right side bubble were blown with the same template and restriction plate. The use of the restriction plate allows very repeatable results. 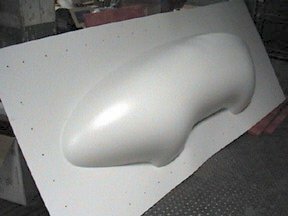 Here's a side view of the blown fairing, showing the beautiful and aerodynamic compound curves that this free blowing technique allows. 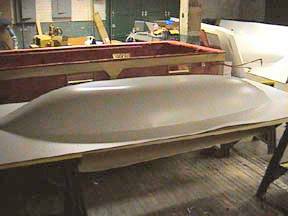 This rear view shows that the fairing bridge template makes the fairing less wide in the front, and gradually wider as the fairing progresses to the rear. This gradual widening will help keep the air laminar. 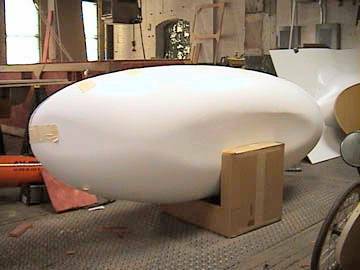 Rob Wood mounted his "Projectile 2" lowracer in this fairing, made beautiful bomb-bay doors for his feet, and added a canopy, then raced it in the 2002 WHPSC in Brantford, Ontario. He did well, but crashed in the tight and winding course at the auto race track. The Sinta body shattered on impact, broke out around both shoulders and had major cracks throughout the fairing. While Rob survived unscathed, the fairing was totaled, and Rob retired it. Apparently Sintra is not a good material for fairings. 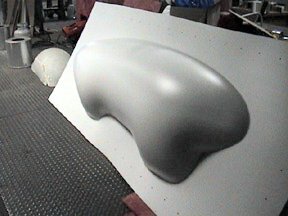 See Rob Wood's Projectile 2 page for more information, as well as Rob's latest Formed ABS plastic fairing project.